On the upper middle left of the flag there should be a white hand figure like a Hamsa, which is obliterated from this picture for some unknown reason. The flag is in light emerald green color with white characters. Good luck charm in Middle Eastern teachings. Symbol for masculine-feminine in Far-East. The sword represents Zulfikar, that, according to Islamic tradition, belonged to Ali, the first caliph after the death of Muhammed. Zulfikar is one of the oldest symbols in the Islam and according to Shiites its existance goes back to Adam who carried it out of Eden down to the Earth. The tradition says that the sword once belonged to Muhammed too who gave it to Ali before his death. The Ottomans adopted the symbolism of Zulfikar that gradually became one of the main symbols of the Janissaries. It was not only an icon used in the war flags but also sculpted as a part of their tombs. Khayreddin Pasha, a.k.a. Barbarossa, was a Greek converted to Islam. He was corsair in the Mediterranean Sea and warlord of Algiers. Selim I "hired" him in 1519 with the title of beylerbey (Province Governor) of Algiers. In 1533, Suleiman the Magnificent asked him to reorganize the Ottoman Navy and gave him the title of Kapudan Pasha (Great Admiral). Barbarossa supervised the shipyards in Galata, where a powerful Navy was created. In 1534, he seized Tunis, Corfu and the other islands of the Aegean Sea. In 1538, he defeated the joint fleets of Charles I of Spain, Venice and the Pope. Barbarossa died in 1546, short after the siege of Nice with the French Navy. Nice then belonged to Savoy, and François I, King of France, was allied with Suleiman against Charles I. The red sandjak of the Ottoman sultan Selim I represents again Zulfikar. 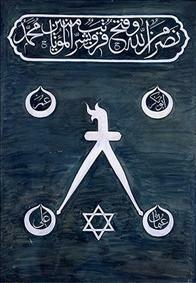 This flag carried to Egypt by Selim I [1466-1520] can be seen in the Topkapi Museum. During the 16th and the 17th centuries the Zulfikar flags were widespread in Ottoman army and numerous red Zulfikar flags left in the battles in Europe are shown in museums and one can even see a red, triangular Zulfikar flag in the Doge Palace in Venice. It might be noted here that the Zulfikar on flags were commonly misinterpreted by mediaeval European painters (and flag authorities) as (tailor's) scissors! Such a flag can be found on several old flag charts. It is reported on Dutch flag charts as Moorse vlag (Moorish flag); later it became 'Moroccan flag'. An example of the mistake is on Bellin's chart, 1756 - reproduced on the cover of Sierksma's book [sie63]. Another example of erroneous interpretation can be seen on the flag of the Great Admiral of the Porte shown on a XIXth century Dutch atlas.